One Savvy Cavvy Goes Rallycrossing! 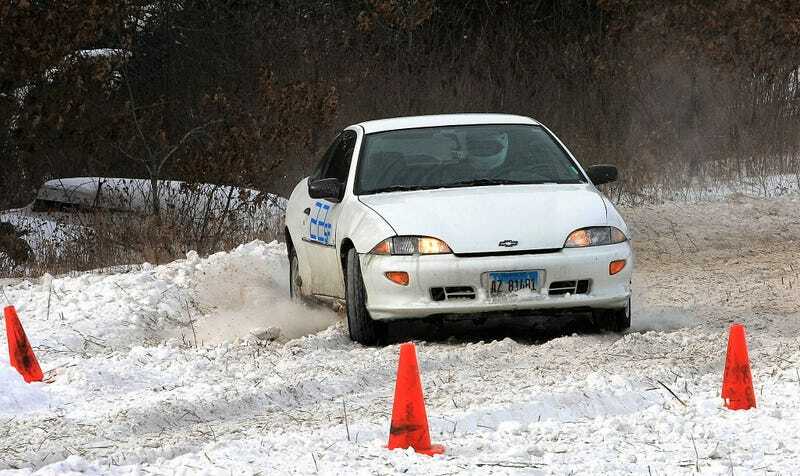 The $500 craigslist car goes rallycrossing in Iowa with balding street radials and a whole lot of heart. So I ended up driving 300 miles to Iowa to chew bubblegum and race...and I’m all outta bubblegum. 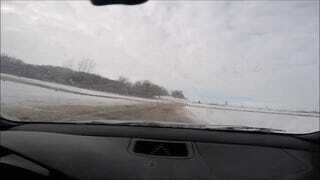 I drove in Friday night going into Saturday morning in the middle of a winter blizzard onslaught. There were times I was puttering along the highway at 30 mph due to the brutality of said storm. I survived and mentally exhausted from being hyper-vigilant throughout the drive so I don’t uhhhh.....die. The way I see it, it’s just practicing car control for the SCCA rallycross event! Not going to lie, it was a little fun driving through that. I crashed at my dad’s place overnight and set out for race day on Sunday. I stopped my car and took a picture of my trip to Vinton Iowa, really beautiful scenery if I do say so myself. I made it, it was like 5 degrees F outside and no matter how many layers I piled on, it hurt to be alive out there. Who care when there’s racing to be had, Amirite? There were 20 or so racers who came to rally, many of them in Subies. Now those not in the know, rallycross is an offroad course in dirt/snow/gravel where you race the stage putting down your best time. We ran 10 times each and so the final result is your CUMULATIVE time. The lower your final time, the better! I’m used to autocross where only your fastest run counts, so I thought this change of pace was pretty neato! I registered the little bugger in the stock FWD category and kind went at it the only way I know how, headfirst and blind. Few design notes, rallycross really rewards good footwork. To know one’s surprise, I struggled getting the power down out there but the J-body chassis is quite forgiving. I’m not saying a 20 yr old Chevy Cavalier is the ultimate driving machine by any means but it telegraphs its intentions way ahead of time so I always know what it’s doing. The suspension did a good job absorbing the blows the terrain dealt it, I credit that to it being worn from 160,000 miles of wear and tear...really more of a marshmallow than steel and gas charge struts at this point. Now with raw final times, I finished midpack at 13th out of 22 overall. I did managed to get a trophy spot at 2nd place in my class! My competition was a Pontiac Grand prix, a Chevy Corsica and a Dodge neon. Interesting to note, I was faster than a couple Subie’s with their sweet AWD nectar of the gods. My only regret is that I didn’t put snow tires on my car, it would have worked miracles for me...oh well, it builds character. After thrashing my car, I went on and drove it 300 miles home without skipping a beat. The roads were arguably better on the way home.